As the "bread and butter" of deer hunters everywhere during the whitetail rut, Buck Bomb Doe 'N Estrus has been responsible for countless buck kills and encounters in the past two decades. The Buck Bomb Doe in Estrus contains 6.65 ounces of pure, fresh doe-in-heat urine. As the "bread and butter" of deer hunters everywhere during the whitetail rut, Buck Bomb Doe &apos;N Estrus has been responsible for countless buck kills and encounters in the past two decades. 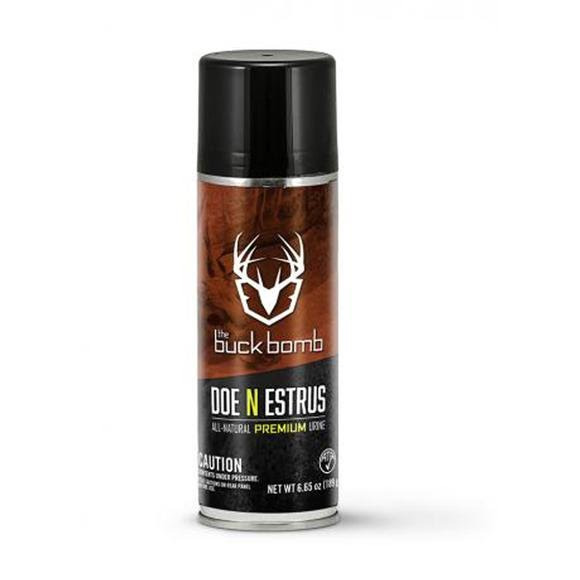 The Buck Bomb Doe in Estrus contains 6.65 ounces of pure, fresh doe-in-heat urine. It&apos;s the most efficient and effective way to lure cruising bucks to your stand from the pre-rut through the peak of the breeding period. Each can of Buck Bomb features the NVERTR 180° ball valve that allows it to be sprayed in short bursts-even upside down. Or, lock down the valve and empty the contents all at once to unleash a potent cloud of scent that can travel in excess of a quarter mile on a 3 mph breeze.